I’m a storyteller, sure I preach, I sing, I even dance (“pretty well for a white man” according to one of my co-workers), but primarily I am a storyteller (not a writer). They call it “narrative theology” but in the Appalachian style. I like to set scenes and the payoffs aren’t usually huge, but still there. There are some topics that I will not joke about – Death is not one of them. I have been privileged to officiate more than 130 funerals over the past 16 years of ministry. Some people I knew well, some I have only met their families. Sometimes I resisted the urge to make a joke, like when I was the only white guy in the room and the last song the family played before I spoke referenced “The man” about 100 times, but I resisted the temptation to start with “Hello, I’m the guy they were talking about.” Some stories I keep secret for years, like the fact that one of the churches greatest humorists, well loved and one who consistently faux-embarrassed her distinguished husband and children had a meaningful service, and was left in her beautiful pink casket at the chapel at the memorial garden with only the young funeral director and me… no coach to transport to the grave-side, just the two of us, and her rose resting place sitting on the wheeled accordion stand… which we were forced to push down the middle of the roads to the grave site in a downpour. The funeral director, still new, was abashed. He panicked, “Don’t tell my boss.” I laughed, “I’m just figuring out how long it will be before I tell her husband.” He looked panicked, then I added, “Listen, in all of the world, of all the people I have met, the person that would have loved this story more than anyone else, is in this casket right now.” He was coming apart, I was falling out laughing. Years later, while talking about her with her widower, I told him, and as he imagined two suit-clad men pushing her across a rainy cemetery in the midst of a storm, he shook his head. “That’s just like her…” and he agreed. He also offered to pay for a new suit, which I didn’t accept. The story is what is important. The stories of scripture, the stories of how we lived our lives showing our devotion. That’s how I preach, it’s how I do a funeral. The only difference is I use the authority of the pulpit when I bear witness to the resurrection. I intentionally make people feel. How? By feeling it myself, which is why the hardest services are for those I don’t know. It’s not that I’m not assured of their salvation, it’s not that I can’t repeat the promises with authority or strength… it’s because I don’t know their stories. But sometimes I know their stories too well. My grandmother’s service, which I shared with my father was a simple affair, but it was the most complicated. I knew her, and I went through her bible, the notes that she had citing scriptures that her children, their spouses and grandchildren “needed” to read so we would change our lives to how she viewed they should be lived. I kept that from the other members of my family – she did deserve to be remembered well. She’d come up the way she had, and fought her entire adult life to find value, to find meaning to find a purpose. My first-wife’s memorial was exactly what she asked for. Country music, everyone wearing their favorite sport’s teams jerseys. And the two most powerful images for me where her UK fan family sporting her beloved UNC blue… that said so much about their love for her (we take Basketball VERY seriously in KY and NC). My friends that had known her came in from states away to sing/play with me. We had about six guitarists, a couple sax players, two drummers, a pianist, and a random bass player that looked a little Beatle-ish who showed up and asked to play. She wouldn’t have said no, so why would we? Lot’s of laughter, and I made it all the way through. Until the last prayer, the committal. I looked at my dad and admitted, I couldn’t get through that. The gathered understood, and he nodded, went into the pulpit and prayed me into tears (which made playing “When the Saints Go Marching In” on saxophone difficult to play – but another sax player was there and covered me brilliantly. Then came my dad’s. I had enough sense to ask the pastor of the church he attended to do the heavy lifting. I’d preach, I’d sing, but he would pray. My dad’s friends in the Covenant Riders (a motorcycle mission group) were there in their leathers. His pulpit familiar friends wore suits and ties. I have a copy of what I said, but have no memory of it. I just remember the beginning and the end. 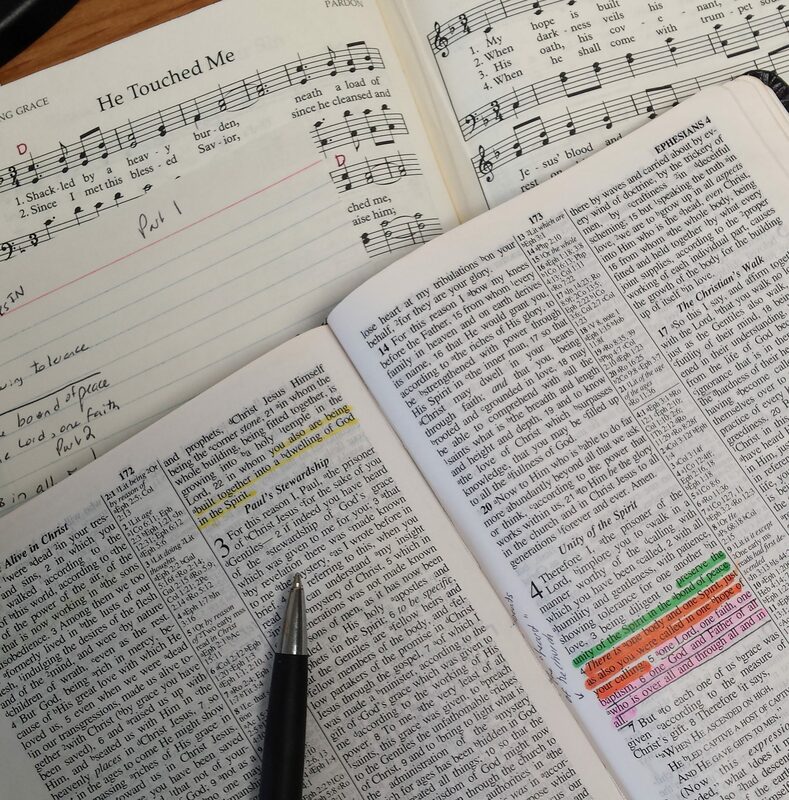 I put my notes on a music stand, and spiked it into the chancel in front of the table and the pulpit. Near the people. And I remember the end – playing the hardest version of two simple songs I’ve ever attempted. Some still point out who wasn’t there – but all I cared about was who was.